Time for a little shameless plug and blatant self promotion: I've just 'opened' Armin's Little Islay Shop on my Isle of Islay pages. So far only with two designs, but I hope to add more over time. 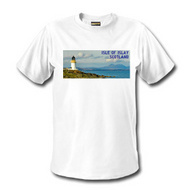 The first design uses the image from the IslayBlog.com banner, the view over the Port Charlotte Lighthouse, Loch Indaal and the Paps of Jura. It's one of my favourite views on Islay and as I ordered one T-shirt myself an obvious choice. This design can only be printed on a white or light background, so I opted for a white T-shirt. The second design uses an outline of Islay with the text 'Isle of Islay - Been there, done that, and will go again'. This is the shirt (or bag) for the repeat visitor (like me), as of writing this my order is in the post. I'll try to post a picture of me wearing it next week. This design can be printed on dark backgrounds, so I opted for a white print on a navy T-shirt. Let me know what you think of the designs and/or anything you would like to see.